Have a question, want to get started with our services or just want to chat? Get in touch with us. 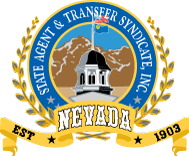 State Agent and Transfer Syndicate, Inc. is an incorporating service and registered agent company whose purpose is to facilitate the formation of business entities and to provide other services as desired. State Agent and Transfer Syndicate, Inc. uses the information provided by you on our order forms to complete the information on the standard forms for filing with appropriate agencies. State Agent and Transfer Syndicate, Inc. is not a law firm and neither State Agent and Transfer Syndicate, Inc. nor any of its employees provide legal services or legal advice. Further, no representations or warranties express or implied, are given regarding the legal or other consequences resulting from the use of our services or forms. If you are seeking a stronger guarantee it is recommended that you contact an attorney. Money paid to State Agent and Transfer Syndicate, Inc. which has already been paid to the state for filing fees is not refundable. State Agent and Transfer Syndicate, Inc., its agents, representatives, and employees specifically disclaim any warranty beyond the limited warranty stated above, whether express or implied, including the implied warranties of merchantability and fitness for purpose. Under no circumstances will State Agent and Transfer Syndicate, Inc., its advisors, agents, representatives, and employees be liable or responsible for any damage or inconvenience caused or alleged to be caused by the use of our services. Your satisfaction is our major consideration!